President Elizabeth (Beth) Stroble wrote the chapter “Rethinking Fit, Choosing to Include, and Educating World Changers” for the book “Making College Better: Views from the Top.” The book was published last month. 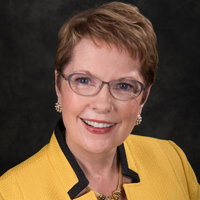 President Elizabeth (Beth) Stroble contributed a chapter to the book “Making College Better: Views from the Top.” The book was edited by Joseph DeVitis, past president of the American Educational Studies and was published last month. It is now available for sale on Amazon.com and at bookstores across the country. The book is a collection of essays from private and public college and university presidents who explore various problems and potential solutions for the American higher-education system, on the premise that there are growing calls for higher-educational “reforms” at the same time that support for higher education from local, state and federal agencies is weakening. Stroble’s chapter “Rethinking Fit, Choosing to Include, and Educating World Changers” elaborates how university faculty, staff, and students can contribute to global awareness in ways that benefit all concerned. Emphasizing the power of diversity and inclusion in their myriad forms, she depicts Webster University’s integrated strategy and systemic design for student success locally and abroad. President Stroble also describes Webster’s network of campus locations and partnerships worldwide that afford its constituents expansive opportunities for international understanding, collaboration, and transformation. This is not the first time Stroble has been featured in a book. In 2015, “#Follow The Leader – Lessons in Social Media Success from #HigherEdCEOs” by Dan Zaiontz was published by EDUniverse Media and included a chapter about Stroble and how she uses her Twitter account @WebsterPres to engage with other higher education leaders and the community at large. Stroble's scholarship includes contributions to book-length projects in literacy, teacher education, school reform, and writing in the disciplines.